Planning a wedding is often a whirlwind of decisions, assignments, lists and cards and Visual QR Codes are a great way to help you provide your guests with important information about your special day and have them RSVP quickly to your invitation. You can also use them later on for sharing the best moments of the happiest day of your life by uploading their photos and videos onto Instagram or an online album. Trying to organize your dream wedding but still not sure how many people are coming? 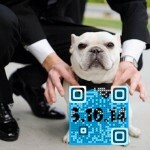 Have your guests help you out by adding a quick Visual QR Code to your Save the Date. All they have to do is scan the code and an automatic RSVP will be opened up on their phone addressed to your email where they can confirm their arrival, check if they’re bringing a plus one and add their meal choice or mode of transportation. Problem solved! Lots of brides today choose to share the excitement of their wedding day with their closest relatives and friends by creating a wedding website. The website can be used to introduce the wedding’s theme, post updates, directions and preferences and even for uploading wedding registries. 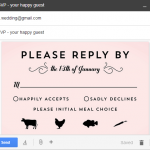 Let your guests in on the fun by providing them with a cute, theme-appropriate Visual QR Code on your invite that will send them straight to your website. For the practical-minded couple, we also recommend a Visual QR Code that can lead straight to your online registry, so your guests can purchase their gifts and send them to you online. Seating Card QR Codes do the trick! 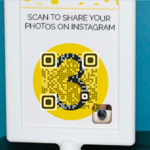 Amaze your guests with a Visual QR Code on their seating cards that they can scan to reach an online wedding album on Instagram where they can upload photos from the reception and party and even add a personal video where they can send you their blessings!